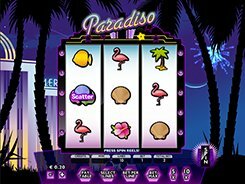 Paradiso is a 3-reel 10-payline slot themed around vacationing in exotic destinations. The reels are set against a star sky, palms and a big concert hall which, taken together, creates a holiday atmosphere. The symbols used on the reels are the typical ones that may be associated with seashore, beach and nightlife. A coin size is adjusted from $0.1 to $10, with up to 5 coins accepted per line, therefore the maximum bet reaches a stunning $500 per spin. Alongside with regular symbols, the slot features a scatter represented by multicolored seashells. Hitting three of them awards 2 coins – not that much but three scatters pay out in any position on the reels no matter where they have landed. Besides, the slot awards two or four free spins, provided you spin in 2 or 3 cocktail symbols on an active payline. Another special symbol is a beach umbrella, with two of them triggering a bonus feature that may award up to 85 coins. The biggest payoff available in Paradiso is 100 coins which is equivalent to $5000; this amount is awarded for hitting three yellow fish symbols on an active payline. PLAY FOR REAL MONEY!